We’re proud of our heritage, and want you to feel like family when you choose New Era Tile & StoneWorks. New Era Tile & StoneWorks was founded in 2010 by Bryce Randall Ballard, a 3rd generation tradesman. Bryce was no stranger to the stone countertop trade as his grandfather started J. Dean Ballard & Sons over half a century ago and his father was also a well-known Tile Setter for over 50 years. Bryce started off in the industry when he was just 15 years old, working on large and complex commercial projects ranging from hospitals, schools and even prisons. Bryce’s father used to say, “In order for your company to do well in construction, you need to have high quality products, competitive pricing, and be faster than your competitors”, Bryce had all the right tools and potential needed to follow his father’s advice and to this day New Era Tile & StoneWorks continues to thrive in both the residential and commercial sectors of the stone countertop industry. Bryce was determined to branch off from the family business to create a company whose main focus was exclusively fabricating and installing stone countertops. Bryce already had the industry background, but he wanted to also have the education knowledge to achieve his dream successfully. The Construction Management program at Fresno State University was ranked third in the nation, making it the perfect university for Bryce to seek the education he desired. Bryce attended Fresno State and shortly after received his Bachelor of Science Degree in Construction Management. In combination with all his knowledge from adolescence in the industry and the education from his degree, Bryce learned the process on how to make, perfect and care for granite, marble and several other countertop materials. 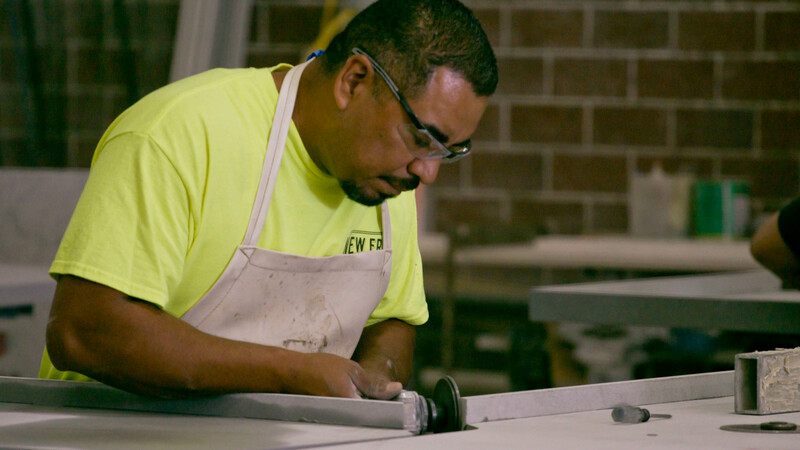 One of the biggest advantages Bryce had in the industry that would set New Era Tile & StoneWorks apart from the competition was by using top of line production equipment and technology, he could produce countertops that are less expensive, more precise and with a faster turnaround time. Along the production advantages already in place, Bryce sought out the most experienced mechanics and fabricators in the industry to employ. The company’s most valuable asset is its employees, as talented tradesmen cannot be easily replaced. Many employees of New Era Tile & StoneWorks have been in the trade for over 30 years and have been employed with the company since the very start in 2010. Our years of experience, integrity and superior workmanship set us apart from others and allow us to prosper in the industry. New Era Tile & StoneWorks plans to maintain these foundational elements that will enable growth of the company and the continuance of our high-end products and services. Our employees play a key role in assisting with our plans for growth, so we intend to preserve present employees and future hires along with offering them unbeatable compensation and benefits. 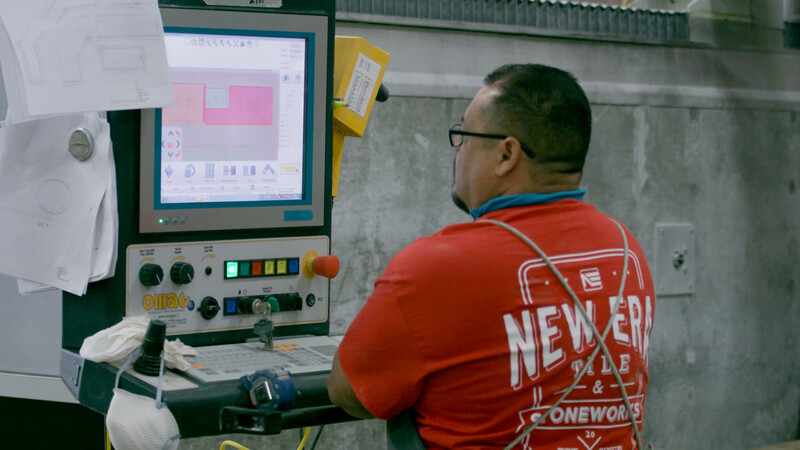 Our team has a long history and extensive knowledge in the industry therefore we’ll continue seeking only the most skilled mechanics and fabricators to ensure we execute expectations and the highest standards at all times. Our machinery, software platforms and cutting-edge technologies are one reason competitors can’t compete with us. We plan to resume investing in the company to stay on top of the latest technologies, techniques and materials to maximize productivity and quality while minimizing cost. We will continue to build sustainable relationships with our clients and rise through any project challenges all while getting the job done on time.